Recently, a customer shared some photo of his newly remodeled bathroom with us. For the wall, he choose to go with the Roxy series in a regular style tile in Quartz color. While on the floor, he used a mixture of the all the style available from the StarkHex series: G. StarkHex Argent and G. StarkHex Mica as well as the decos, the G. StarkDec Gris. 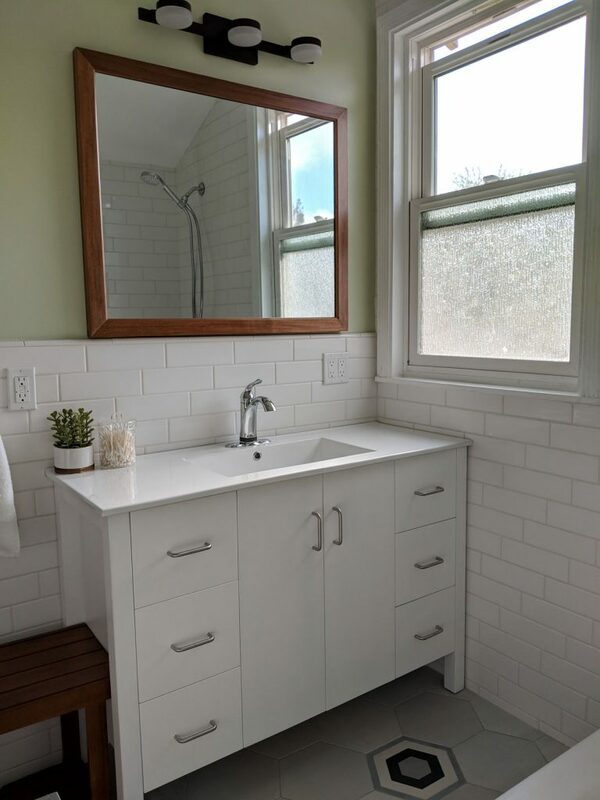 For the vanity, this customer installed our MJ-808 Matte White vanity and changed out the original handles for personalized look. 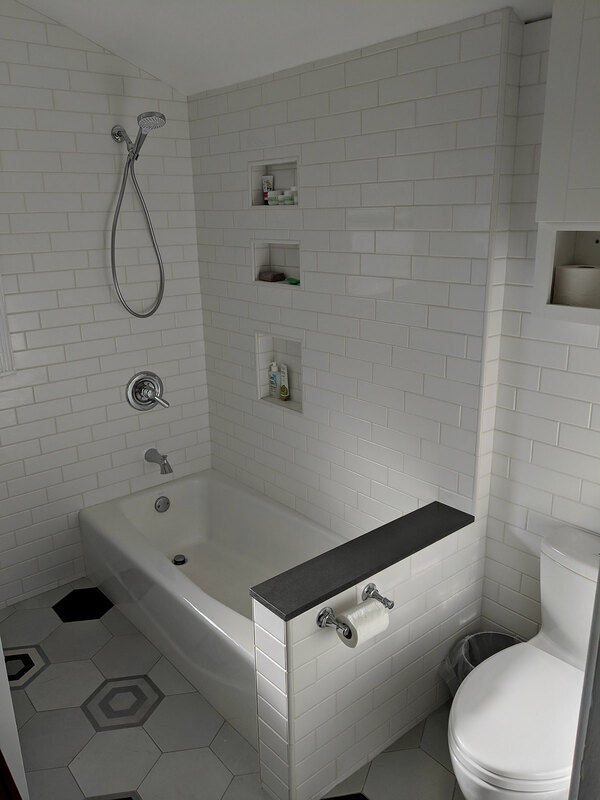 For the bath, he choose the Kohler Villager cast iron tub for its simple lines and durability. 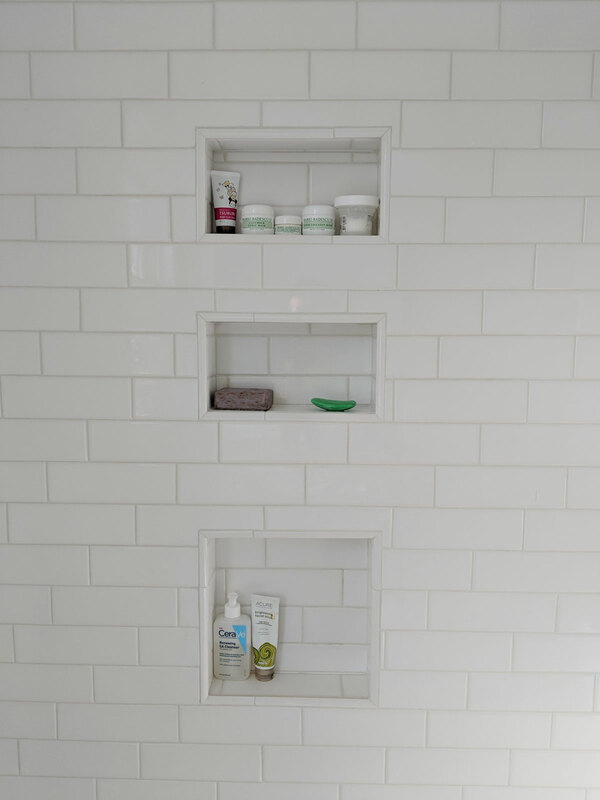 He complemented his shower area with a selection of pre-built in-wall shower niches customized for his needs. For the toilet, he choose the Toto Aquia dual flush toilet for it’s water conservation and clean lines. A better view of how to keep bottles from cluttering the sides of the tub. The Roxy series comes in two distinct styles: a regular(flat) wall tile and a framed style. Both are 3″x9″ and are made in Spain. For the regular wall tile, it’s available in 4 colors: Beryl (Bone), Hematite (Dark Grey), Moonstone (Light Grey) and Quartz (White). For the framed style, it’s available in 2 colors: Moonstone (Light Grey) and Quartz (White). It also has a 13″x13″ Two Tone Mosaic available in 3 colors: Beryl with Moonstone Dot, Quartz with Hematite Dot and Quartz with Moonstone Dot. 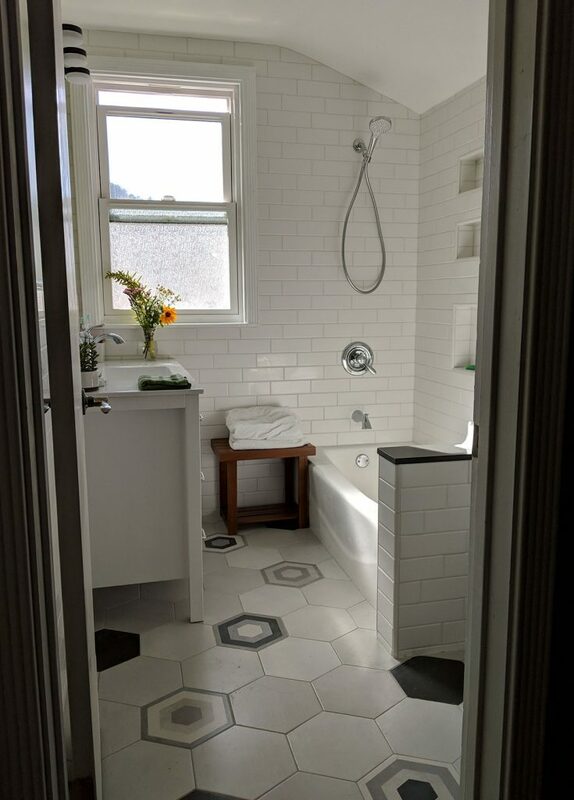 The StarkHex series is a 10″x11″ Porcelain Hex Tile from Spain. The tile is available in 2 colors: Argent and Mica. Both have a slight variation within its color for a natural look. The decorative pieces are available in 1 color: G. StarkDec Gris. They have a selection of random patterns and count.